Spring Break 2019 in Mazatlan - Having a safe and fun Spring Break in Mexico! Mexico Spring Break! Spring Break 2020 in Mazatlan, Mexico - Party on the beach, bar-crawl at night and enjoy zip lines and other destinations on day trips in Rural Sinaloa! A Guide to the coolest Spring Break you will ever have: beaches, bars, music, nightclubs, nightlife, really great thing to do outside the city and Spring Break in Mexico safety tips! 2020 Spring Break in Mazatlán! What do I need to bring? | What if I have an emergency? Deciding to take your Spring Break in Mazatlan in 2019 is one of the best choices you can make in your entire college career! Video of Spring Break in Mazatlan, Sinaloa, Mexico! Spring Break in Mazatlán is way cooler than Cancun, Puerto Vallarta or Cabo! 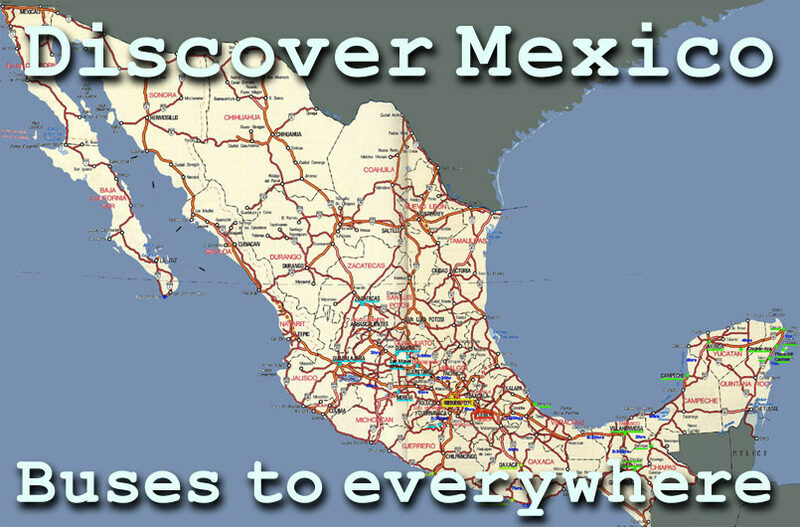 Traditionally, Mexico has four important destinations for Spring Breakers from the United States and Canada: Cancun, Cabo, Puerto Vallarta and Mazatlan. Unlike the first three, Mazatlan was not constructed solely for tourists: it is an important Mexican port -- with a rich history dating from the 1600s -- that offers Spring Breakers a breathtaking variety of sights and attractions to enjoy during their time away from the beach! Simply stated, Mazatlan has a lot of spectacular beaches, and they are one jam-packed party over Spring Break! 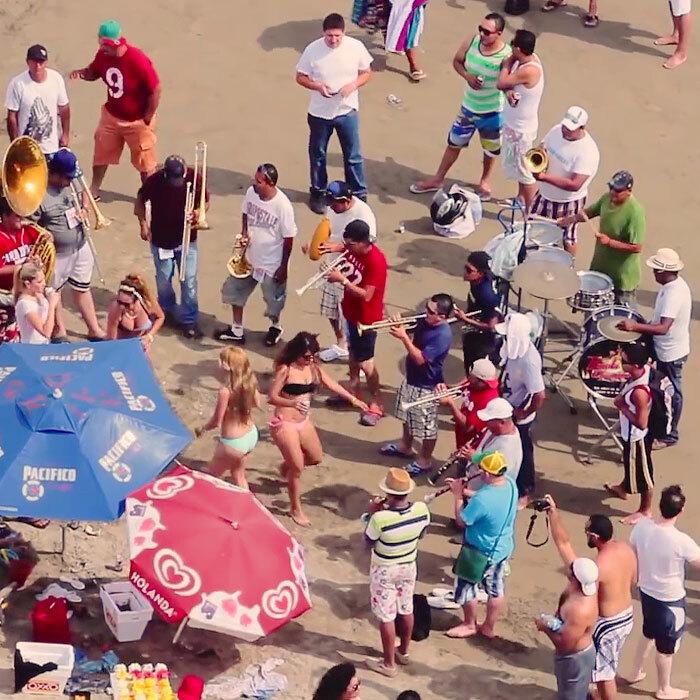 Mazatlan beaches during Spring Break are filled with partying, music and laughter. Starting at Playa Olas Altas located on the western edge of the Centro Historico and running north to Playa Bruja (Witch Beach), Mazatlan has one of the longest stretches of uninterrupted urban beach in Mexico. Water sports abound along these beaches, including surfing, banana boats, jet skis, wave runners, parasailing, sailing and much more. 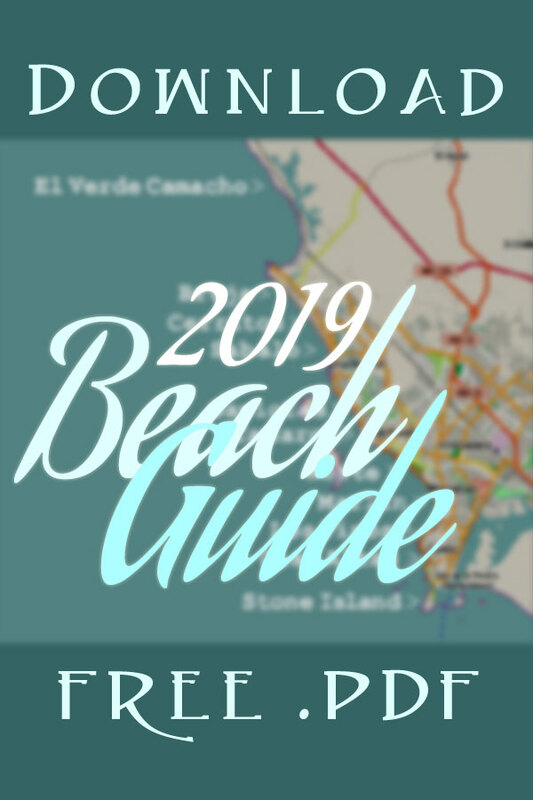 But even at the height of the season the sheer number of miles of beach mean that tranquil spaces can still be found by Spring Breakers who want to take a break from the party, kick back, and just do a little fishing -- or napping! Come nightfall, Spring Break moves into the bars, pubs and cantinas. Mazatlan has every type of bar imaginable, from traditional bars to sports bars, wine bars, pubs, gay bars and Mexican cantinas. The drinking age in Mazatlan is 18, and bars and cantinas get in serious trouble for serving underage customers. No matter how old you think you look, you look very young to an older person: just like in the United States or Canada, carry I.D. when you go bar-crawling! Cantinas are of particular interest, and quite different from bars American and Canadian students are used to near their campuses. Cantinas are a type of Mexican bar traditionally patronized exclusively by men for the purposes of drinking booze, eating botanas (appetizers) and playing dominoes, cards or other table games. 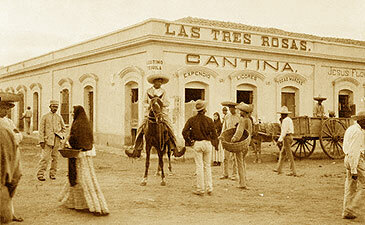 As politically incorrect as it is, Cantinas traditionally had signs that expressly prohibited women from entering. Luckily, cantinas in Mazatlan have moved beyond that primitive approach to cocktailing, and one of the best -- Edgar's in the Centro Historico, a Mazatlan mainstay since 1949 -- actually has a sign that explicitly states that women are welcome! Cantina or bar, the cost of alcohol drinks in Mazatlan is very low compared to the United States or Canada, and lots of drinks that are considered "exotic" in the US or Canada -- our hometown Pacifico beer or many brands of tequila, for example -- are dirt cheap. Liquor of all types is sold at a variety of types of stores. 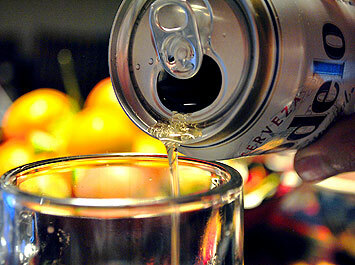 Information about your booze take-out options can be found by clicking here. Beyond bars, Spring Break in Mazatlan offers a healthy choice of clubs with dancing and, in many cases, open bars covered by the price of admission. Notable examples are Joe's Oyster Bar and Bora Bora, in Valentino's on the Malecon overlooking the Sea of Cortez. Bora Bora is absolutely enormous (over 1000 capacity) and rocks nearly to dawn with electronica, pop hits, música tropical, reggaeton, banda and anything else that the DJ dreams up. If you want to take a bike ride on your Spring Break, you have a basic chioce to make: an urban ride or an off road mountain bike excursion. 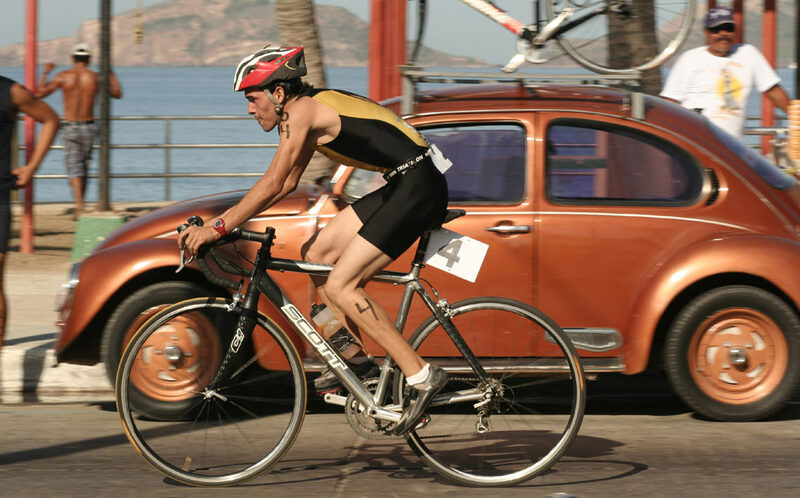 Mazatlan offers both, and you won't regret getting off the beach for a biking adventure! There are a number of bike rental shops that can rent you an nice well-maintained cruiser bicycle perfect for peddling around town. 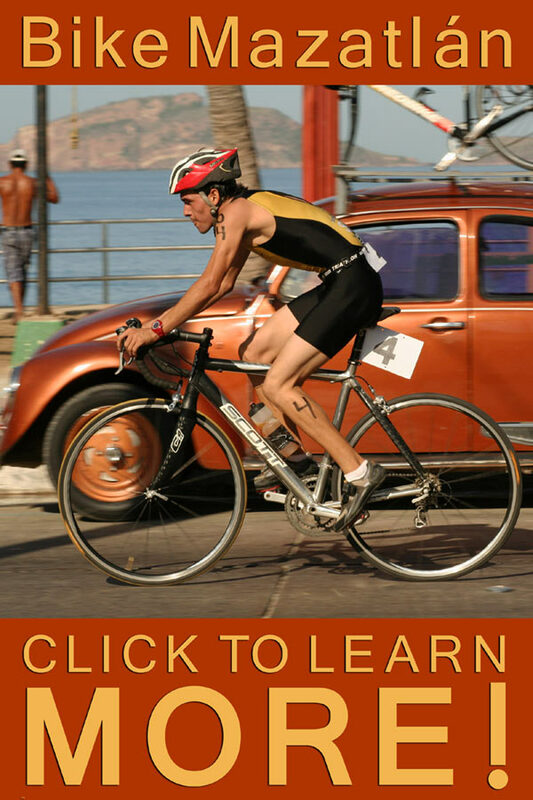 Bike rentals can be hourly, 1/2 day, daily or even longer, and safety equipment -- specifically, helmets -- are provided. Be aware that Mexican drivers are even less aware of bicyclists than Canadians and Americans -- you probably didn't think that was possible, right? -- so you need to be very aware when riding on streets. A great way to avoid interacting with cars is to stick to the Malecon, which is extensive, isolated from traffic and right on the beach. If you're into mountain biking, this Spring Break could be the adventure of a lifetime -- the foothills of the Sierra Madre mountains just outside Mazatlan provide limitless spectacular off-road biking opportunities! 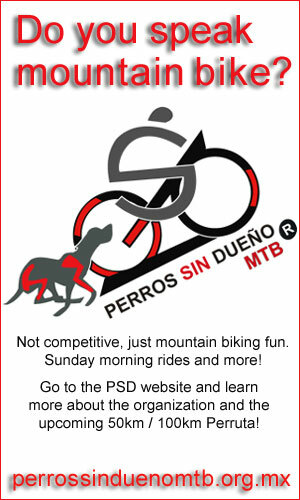 Several bike tour businesses and organizations conduct mountain biking tours and excursions perfect for Spring Breakers, notably Fernando Kelly of Kelly's Bicycle Shop, Rudy Valdez of Mazatlan Bike Tours and our mountain biking club Perros Sin Dueño (loosely translated, Stray Dogs). We could go on and on about how cool mountain biking with Perros Sin Dueno -- or Fernando Kelly or Rudy Valdez -- is, but a video is worth much more than a thousand words. This one was shot on a Perros Sin Dueno excursion to Mexiquillo, a spectacular nearly 35,000 acre nature preserve in Durango State just up Mexico Federal Highway 40D from Mazatlan. Enjoy. Feel like getting off the beach for a day and getting some (sort of) exercise? 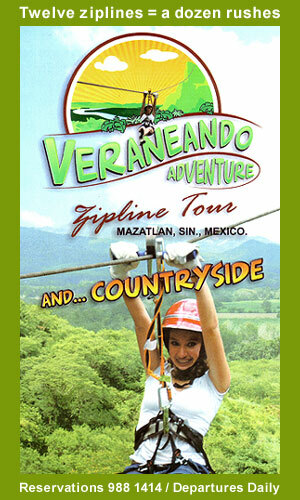 How about a zip line excursion into the foothils of the Sierra Madre mountains? 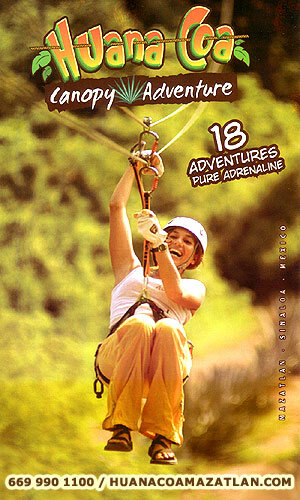 Mazatlan is home to two excellent zip line tour companies with impeccable safety records: Huana Coa Canopy Adventure and Veraneando Adventure. Both have built spectacular zip line runs over the lush Sierra Madre forest that are some of the most spectacular in Mexico. Both companies offer big-time fun beyond zip lines: Veraneando Adventure can take you on a 7 mile river ride where you get to experience the jungle and wildlife of Sinaloa close-up, and Huana Coa Canopy Adventure also offers horseback riding and ATV excursions. There are also two further treats awaiting Huana Coa zip line clients on Spring Break: they take you up to the zip line start platform in a Swiss-made Pinzgau all terrain military vehicle capable of climbing 50 degree grades, and the day of zip lining ends at the La Vinata Los Osuna tequila distillery! Hangover making you a little edgy on Spring Break? 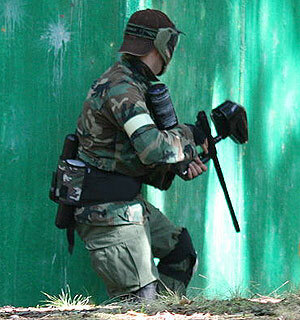 Sweat those aggressions out with a spirited paintball shoot-out! Mazatlan has two companies that provide serious paintball in challenging fields and venues: Gotcha Las Espuelas and Master Gotcha ("gotcha", in case you were wondering, is what paintball is called in Spanish). Both paintball companies have rental equipment and, conveniently for Spring Breakers, Master Gotcha is walking distance from the beaches of the Golden Zone. If you want to stay in the American / Canadian fast food groove that you're probably used to at school, Mazatlan has all of the resources to sustain that. Burger King; Carl's Jr.; Domino's; KFC; McDonalds; Subway -- the whole shootin' match, and most of them even deliver, an amenity sadly missing from most of the burger joints in the United States and Canada. But if you stick with familiar fast food you'll only be cheating yourself: Street food in Mazatlan is delicious and cheap! Generally speaking, you can forget about the scare-tactic advice you may have read in some guide books (or from well-intentioned friends back home, most of whom have probably never been to Mexico) about supposed sanitation issues at Mazatlan street food carts. Carts are inspected for cleanliness and the Wisdom of The Crowd -- the regular local patrons -- pretty much assures you that a popular street food vendor is serving clean food. If he wasn't serving clean street food he a) wouldn't be popular and b) probably wouldn't be in business. Of course: use common sense. 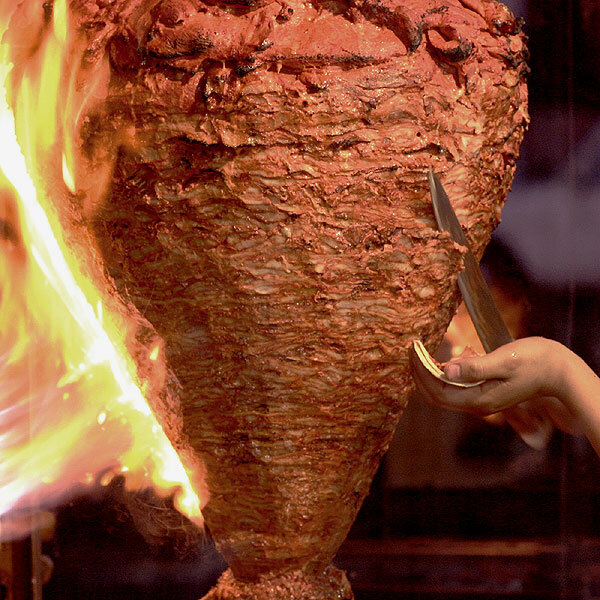 Heat -- like the flame charring your mouth-watering carne asada -- kills germs. Is the hot food being served really hot? You can see with your own eyes the general appearance of the cart, and whether or not the raw food looks fresh: there is no more "open kitchen" than a street food cart! Don't worry about the dishes -- either you will be served on styrofoam or, almost always, your plate will be wrapped in a disposable plastic bag. There is as well, of course, the "compared to what?" question. 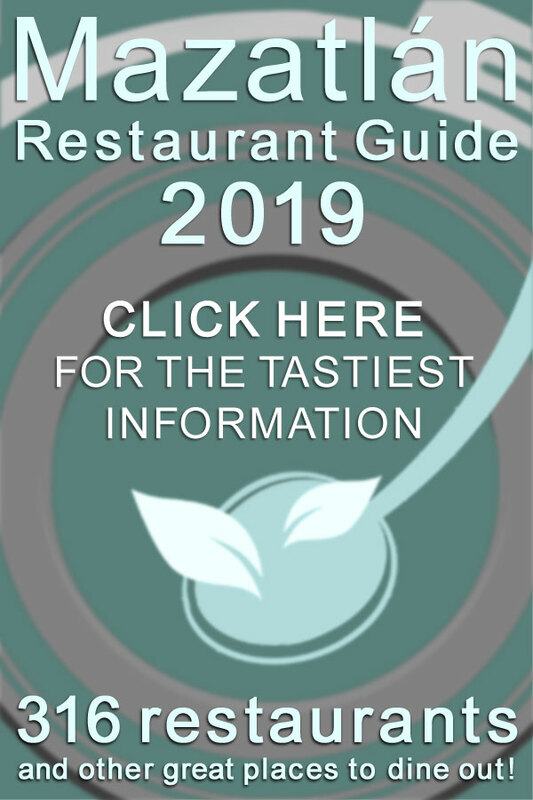 A friend of this website used to manage a region of international-brand fast food restaurants in Canada -- over 30 restaurants. 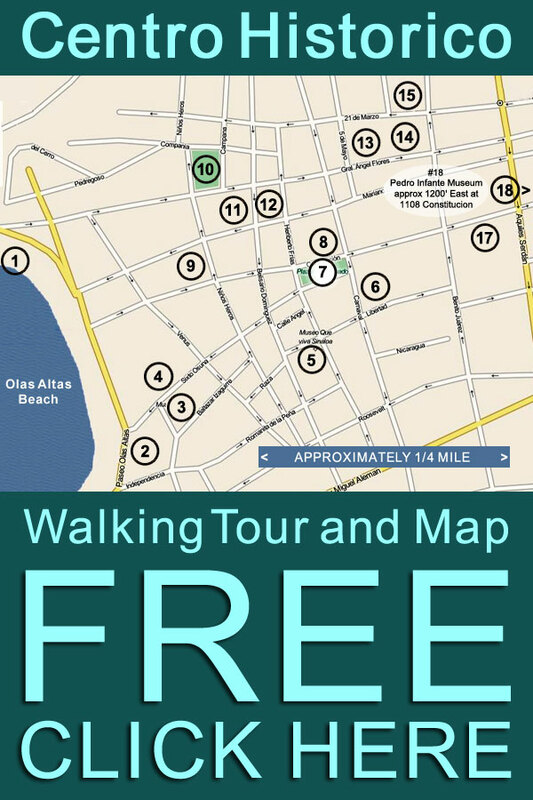 The Mazatlan Centro Historico (Historical Center) is one of the colonial gems of Mexico, and walking its streets you feel history all around you. 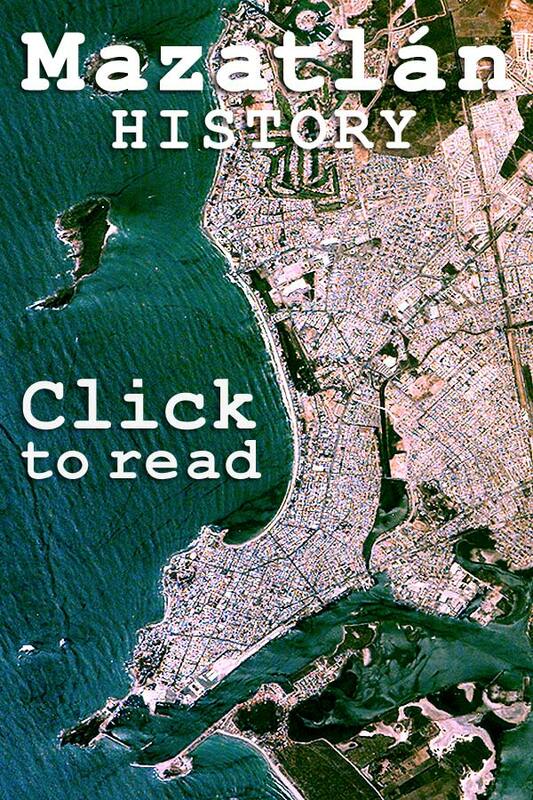 But the Centro Historico isn't all about history: it is the birthplace of the Mazatlan Renaissance which has brought artists and entrepreneurs from around the world to our port. Populated with sophisticated restaurants, galleries and, yes, bars, the Centro Historico makes for a fascinating break from the Spring Break beach scene. When you're walking in the Centro Historico you may well see a person -- likely about your garanparent's age -- wearing a blue shirt. 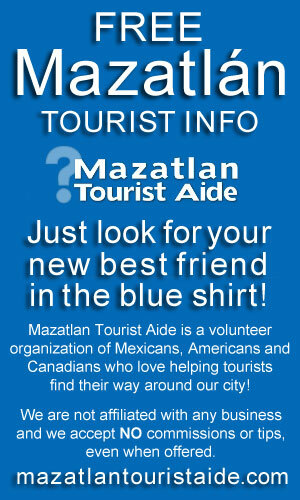 That would be a Mazatlan Tourist Aide, one of a group of dedicated Americans, Canadians and Mexicans devoted to helping visitors to our port find what they're looking for. 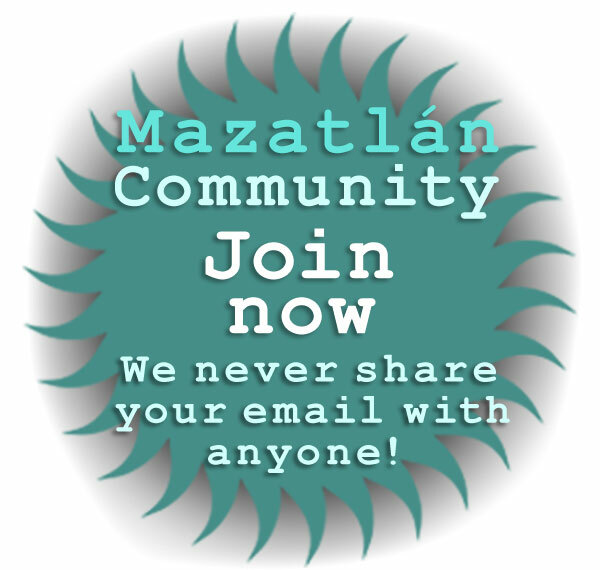 Take advantage of these generous people's knowledge: most are long-time full-time expat residents of Mazatlan with a broad and deep reservoir of information about the community, and an unwavering desire to help tourists -- free of charge. Mazatlán offers Spring Breakers more than perfect beaches - if you can get yourself off the beach! 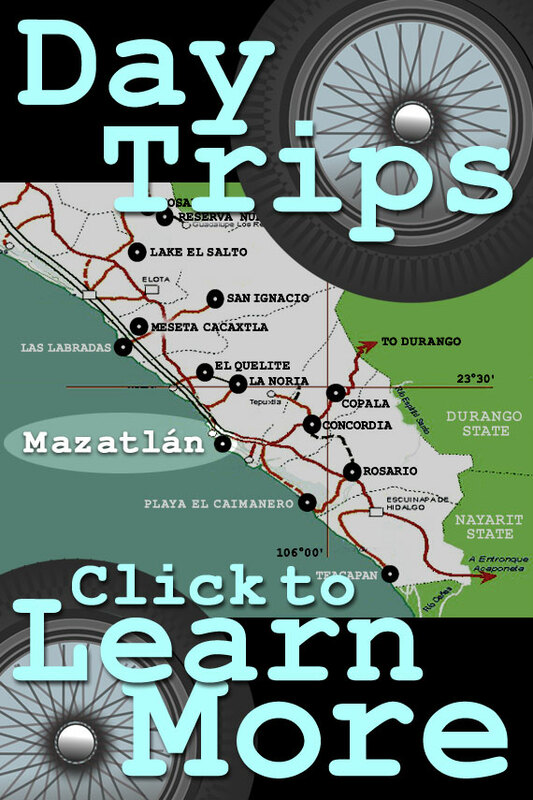 One of the most amazing things about Mazatlan -- and something that truly sets it apart from other Spring Break destinations in Mexico -- is the number of highly recommended day trips that that you can take whether or not you have a car! The variety of terrain and the diversity of the pueblos and other destinations within day trip distances from Mazatlan is simply breathtaking. Sinaloa State offers Spring Breakers who want to get off the beach everything from quaint colonial mountain communities to massive nature reserves and tranquil seaside getaways (OK, we're back to the beach...). 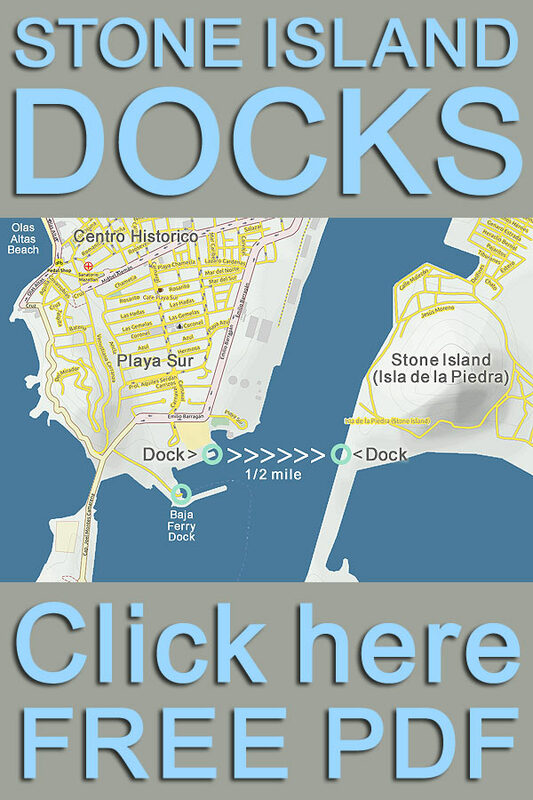 • The closest day trip destination to Mazatlan's main beaches are the beaches of Stone Island. Just a short lancha boat ride from the Playa Sur Embarcadero near the ferry terminal at the southern end of the older part of the city, the palm-lined beaches of Stone Island are the most popular and highly recommended Mazatlan Spring Break day trip destination. 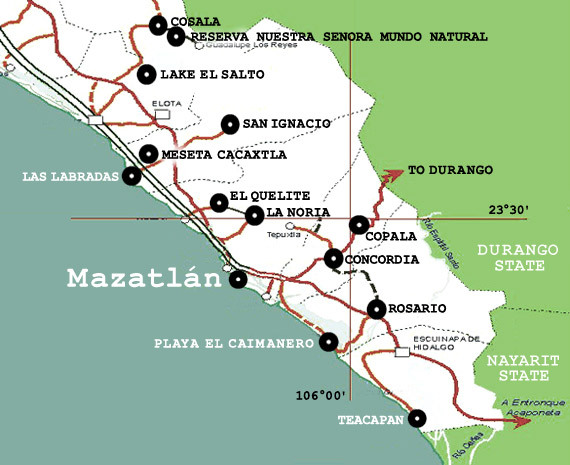 • The very closest day trips you can take that are genuinely outside Mazatlan are to El Quelite and Concordia, both of which are lots of fun and give you a real experience of the magic of the pueblos of Rural Sinaloa State. 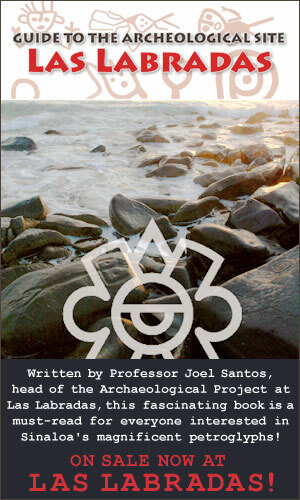 • For art lovers, Las Labradas is a Mecca -- roughly 640 ancient petroglyphs dot nearly 1200 linear feet of shoreline just 45 miles north of Mazatlan. These wonderful relics evoke the mysteries of pre-Columbian mexico, and its people. If you're not so into art you are, of course, back on the beach! 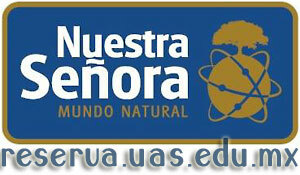 • Ecotourists love the nature reserves of Meseta Cacaxtla and Reserva Nuestra Señora Mundo Natural -- both of which offer experiences of ecosystems that are strikingly different from those that exist in the United States and Canada. There are two main ways that American and Canadian students can travel to Mazatlan for Spring Break: by airplane or by bus. Mazatlan is connected to the rest of the world by airlines operating out of General Rafael Buelna Aeropuerto Internacional (MZT / MMMZ), our international airport located just southeast of town. Now served by over a dozen airlines, the Mazatlan international airport offers flights to numerous destinations in the United States and Canada and, through connections at major hubs, anywhere in the world. 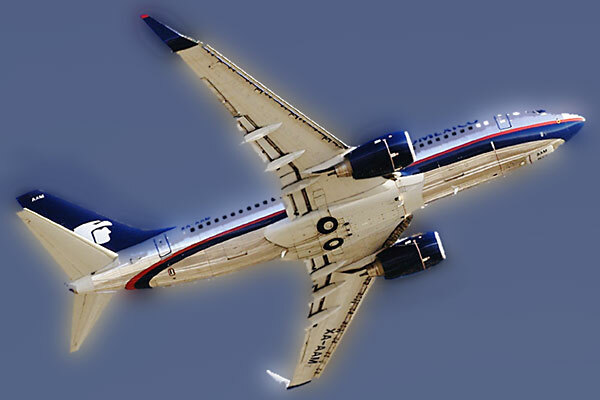 It is worth noting that two smaller Mexican air carriers with excellent saftey records -- Aereo Calafia and Aereoservicio Guerro -- offer flights from Mazatlan to Cabo. We invite you to visit our Airport, Airlines and Flights page to learn more about the airlines serving Mazatlan. Some Canadians and most Americans have a prejudice against travel by bus. Much of this aversion -- particularly for Americans -- stems from the deterioriated state of Greyhound and its buses in recent decades. Coupled with the "chicken bus" stereotype of buses in Mexico, many Spring Breakers never consider traveling to their Spring Break destination by bus. This is a really-really big mistake, particularly if your destination is on the Pacific coast (like Mazatlan or Puerto Vallarta) or within the Baja Peninsula, like Cabo. Forget about the Chicken Bus: buses are the primary interstate transportation modality in Mexico, and Mexican interstate buses are top-class land yachts usually manufactured by Mercedes or Volvo. Primera Clase (First Class) interstate buses from major carriers in Mexico only seat roughly 36 passengers in 2x2 seating, some even higher-line express buses just roughly 27 in a 1x2 seating configuration. As befits modern transportation used by all classes of Mexicans -- including well-off Mexicans and business people -- these buses are equipped with bathrooms (sometimes both his and hers); in-transit movies (usually of the poor quality that you would experience on most airline flights) and wifi (so you can stay in touch with parents and friends and show them what a good time you're having). 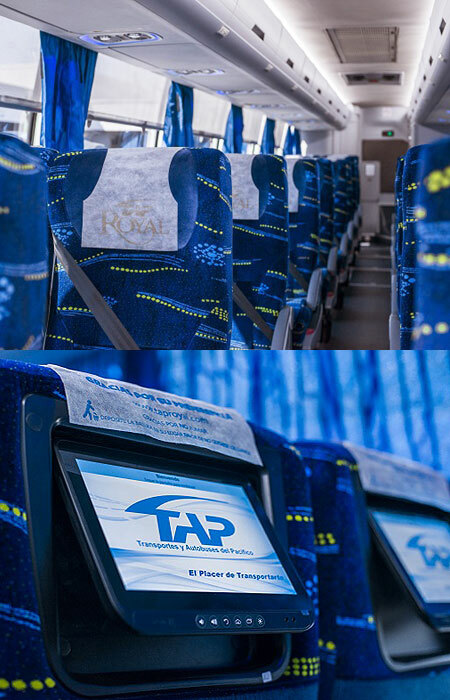 TAP (Transportes y Autobuses del Pacifico) -- offers cross-border buses that depart from Phoenix and Tucson in southern Arizona and travel south down Mexico's beautiful Pacific coast. Transportes del Norte has the most extensive route map in the United States, offering departures from not only cities in Texas -- its original United States origins -- but in Tennessee, North Carolina, South Carolina, Georgia, Alabama and even Illinois! 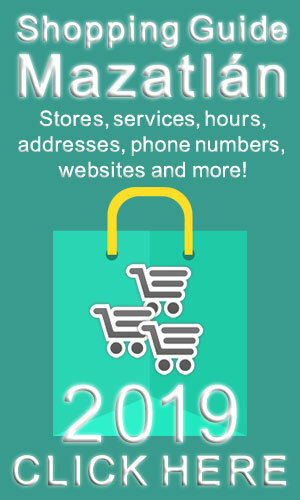 Tufesa serves a number of cities in Arizona, Nevada and California. Spring Breakers visiting Mazatlan from Texas or points further north and east are in for a special bus travel treat: a journey down Mexico Federal Highway 40 / 40D through the Sierra Madre mountains. 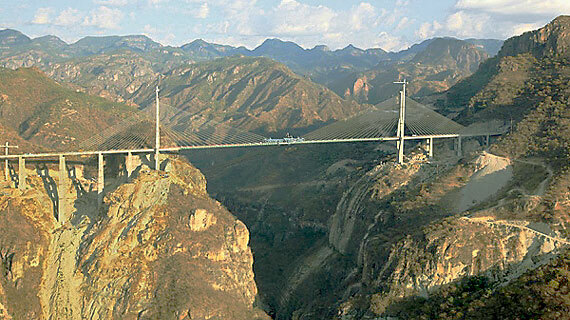 This newly re-engineered highway traverses some of the most spectacular terrain on the planet and includes 115 bridges (including the world's highest suspension bridge) and 63 tunnels in just 140 miles! 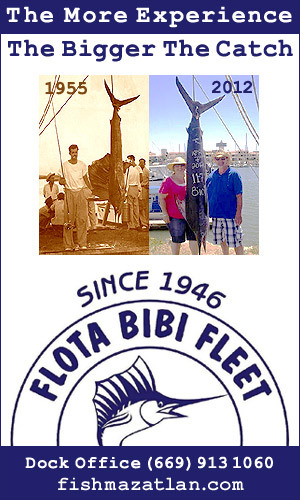 We're sure some of the flatland dust on the way to South Padre Island can look sort of OK in a certain light but, come on, this is a real grownup international adventure travel bonus to your Spring Break vacation! 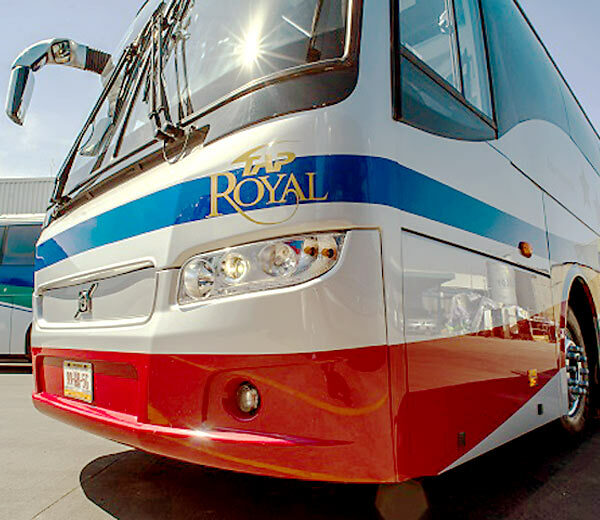 More information about Spring Break buses to Mazatlan can be found by clicking here for the buses page of this website. Cheap recommended Mazatlán hotels for Spring Break 2019 - if you book now! 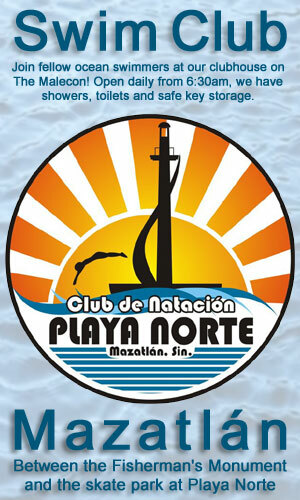 Mazatlan has an excellent number of recommended budget hotels that are perfect for Spring Breakers. mazatlantoday.net lists 15 cheap hotels in Mazatlan that are anything but "cheap" in their amenities -- amenities that are usually only available at higher room rates in other Spring Break vacation destinations within Mexico. Some even have kitchens! Mazatlan budget hotels are located throughout the city, so Spring Breakers have a choice of staying in the Golden Zone, the Centro Historico, right on the Malecon or even just a lancha boat ride away on Stone Island! It is also worth noting that Mexican hotels are generally fairly liberal about the number of people that can stay in a hotel room for the base room rate so, if you don't mind a bit of crowding, the cost per person gets even lower. 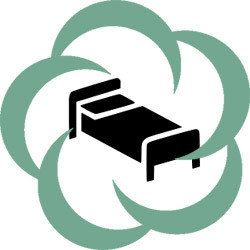 We invite you to go to our budget hotel page and review your 2019 Spring Break lodging options. If you feel like getting funky and paying next-to-nothing for your Mazatlan Spring Break lodging, check out the Funky Monkey Hostel by clicking here or on Facebook, a massively well-reviewed hostel right in the heart of Mazatlan! A note about hotel occupancy rates: Mazatlan is an extremely popular beach destination throughout the Winter, and these budget hotels fill up quickly, especially if your 2019 Spring Break is earlier in the season. If you really want to score one of these value-priced rooms, the time to book is whenever you are reading this! It is only natural to want to share your Spring Break experiences with friends in real time via social media and other electronic communication. But let's cut to the chase: your parents are going to worry about you whether you take Spring Break in Mazatlan or somewhere boring like Miami Beach or South Padre Island -- and they need to be reassured that you are safe! One of the most common objections that parents raise about proposed Spring Breaks anywhere in Mexico are based -- conciously or unconciously -- upon the mistaken notion that their beloved young college student will have fallen into a bottomless black hole of non-telecommunication. Nothing could be furher from the truth! Mazatlan -- and every other major Spring Break destination in Mexico -- is awash in telecommunication options, starting with ubiquitous free wifi. Simply stated, if you have Skype on a wifi-enabled mobile device, you're good to go. Beyond wifi, if your 850 / 1900 GSM phone is unlocked (it does need to be GSM), it is trivial to get a Telcel (mobile phone provider) Amigo Express sim card with a local (area code 669) phone number. These sim cards are sold in a very wide variety of locations including OXXO convenience stores, which are so numerous that in parts of Mazatlan you can literally see from one OXXO to the next. Telcel Amigo Express sim cards now cost under $2 USD, with a roughly $3 USD required initial minute charge-up. 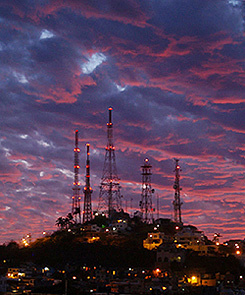 If wifi isn't sufficient for you, Telcel offers very inexpensive prepaid data plans. If your phone or other mobile device isn't GSM and you simply want to make phone calls, you could simply buy a Mexican Telcel mobile phone. If you're not comfortable just walking into an OXXO and buying a chip, Telcel is there to help you choose telcom products and services! In Spanish, a Customer Service Center is a Centro de Atención a Clientes, and Telcel has a number of them in Mazatlan where you will get the personal attention you deserve. Probably the easiest to find are in the Gran Plaza Mall and in the new Galerias Mall (right beside the entrance to Sears) in Nuevo Mazatlan. Both of these Telcel customer service centers are open from 11am until 8pm every day, accept credit cards and virtually always have at least some English-speaking service folks. 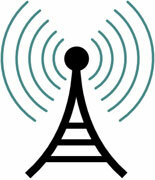 For a more complete overview of your telecommunications options while on Spring Break in Mazatlan visit our WiFi, Internet and Mobile Phone page. Generally speaking, you don't need to bring anything on Spring Break in Mazatlan -- beyond your passport -- that you wouldn't bring on Spring Break to any destination in the United States. It is probably better to carry a little more cash that you might in the United States or Canada: the folks selling lots of the fun stuff like street food, beach shots of tequila or bananana boat rides will likely not be able to accept credit cards. Sunscreen is a must: at latitude 23° you're roughly as close to the equator as Kauai Island is in Hawaii, which is a lot closer to the equator than most of us are used to! If you're smart-phone crazy (and who isn't? ), you might want to download a translation app if you don't speak Spanish -- many work remarkably well, including for reading signs using your camera. 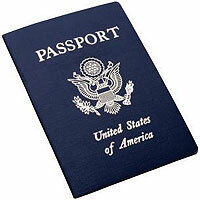 The Travel Tips and FAQ page of this website offers lots of detailed information about lots of little details. For less than absolutely crisis-moment medical services, Mazatlan offers a wide and deep pool of competent physicians, hospitals and medical clinics. 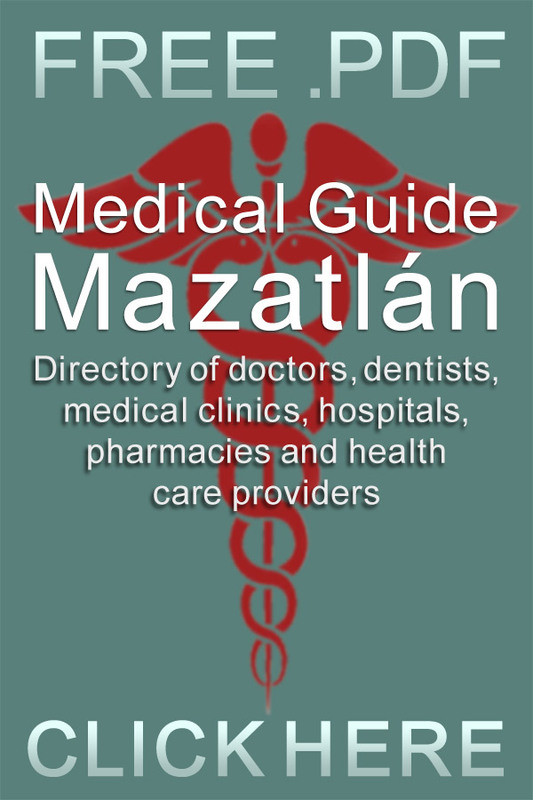 A detailed overview of the healthcare resources available to Spring Breakers in Mazatlan can be found on the Hospitals, Doctors, Pharmacies and Emergency Medical Services page of this website. 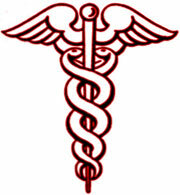 It is widely believed that Atlantic Health International Hospital SHARP is the Roll-Royce of healthcare in Mazatlan. SHARP treats many foreign patients and has an established relationship with Tourist Health Care, who process the medical paperwork for foreign patients with medical insurance from their country of origin. It is highly unlikely, but not impossible, that you might run into a problem over Spring Break 2019 in Mazatlan that would cause you -- or your parents -- to reach out for consular assistance. Mazatlan has consulates representing seven countries: Canada, Denmark, France, Germany, Guatemala, Holland and the United States. Calls to the United States Consulate in Mazatlan are answered by a central call center that handles all calls for all of the 9 Consulates and 9 Consular Agencies in Mexico. The call center will connect an individual to the appropriate consulate upon their request. How to have a Safe Spring Break in Mazatlán - or anywhere in Mexico! Many Americans and Canadians -- and not just Spring Breakers, people your parents and grandparents age -- appear to believe that there are no laws or rules governing their behavior when they are in Mexico. This is simply not the case, and the consequences of behaving like an idiot in Mexico are just as dire as in the United States or Canada. 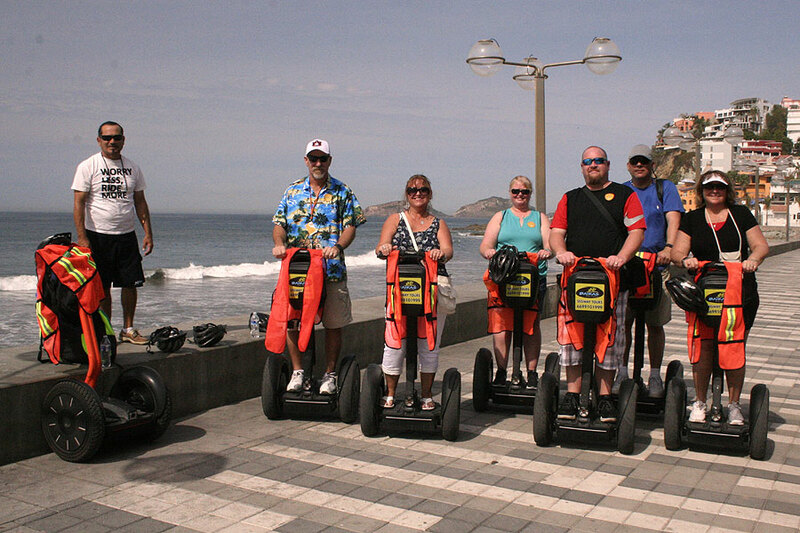 We offer six simple tips that, if you follow them, will virtually guarantee a safe, 100% enjoyable, experience of your 2019 Spring Break in Mazatlan -- or any other destination in Mexico you might choose to visit. It is important to have prescriptions for any prescription medications you bring into Mexico and, despite whatever you may have heard, getting a prescription filled in Mexico requires a prescription from a physician. Mexican pharmacies -- and border control people -- generally don't like photocopies, so get an original from your doctor before your Spring Break trip to Mazatlan. This advice is particularly true if you are taking interesting opiate-based medications such as Fentanyl, Hydromorphone, Morphine and Oxycodone, or commonly abused medications such as Valium or Hydrocodone / Paracetamol (Lortab, Norco, Vicodin). Mexico has extremely strict laws regarding firearm ownership. If you are caught with a weapon -- or even ammunition -- you will be in big trouble. Talk about obvious, right? Well, some people try this stunt, and it is a giant mistake. A very high percentage of really nasty problems involving jail time -- or even worse consequences -- that Americans and Canadians of all ages get into in Mexico relate to the purchase and use of illegal drugs including but not limited to Marijuana, Cocaine, Heroin and Methamphetamines. Again: Mexico has strict drug laws and simply associating -- even briefly -- with the people who sell illegal drugs carries not only substantial legal risks, but risks to your physical safety. Mazatlan is home to Pacifico Beer, and tequila of all qualities and at all price points is ubiquitously available. It is remarkable how many Americans and Canadians of all ages imagine that it is perfectly OK to drive blasted out of their minds in Mexico. These same people wouldn't ever think of driving drunk in Houston or Vancouver but, somehow, they think it's fine to drive drunk in Mazatlan or elsewhere in Mexico. Word to The Wise Spring Breaker: it's not fine, and there are very real and very nasty consequences if you get caught. Be advised that Mazatlan has equipped many of its police cars with breathalyzers. If you blow drunk you're very likely to end up in jail, at least overnight, and face a substantial fine. That is a best-case scenario. If you are involved in a crash while drunk -- in the worst case scenario where injury or death is involved -- you could be in jail for years. 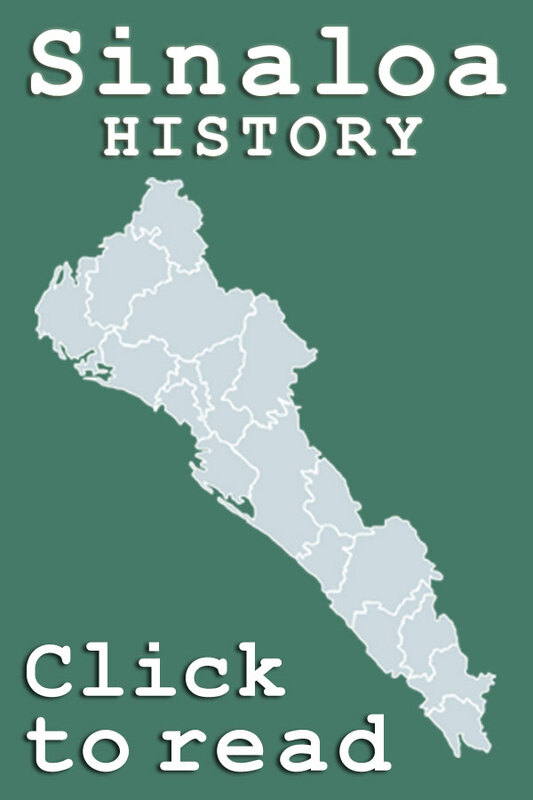 Your parents, grandparents, older siblings or older aquaintances may have regaled you with stories from their youth about their purported adventures bribing Mexican police -- perhaps even over a long-ago Spring Break in Mazatlan! That was then (maybe, possibly, if the story wasn't exaggerated or wholly fabricated) -- this is now. Policing throughout Mexico -- and Mazatlan in particular -- has come a long way, and is far more professional than it was even just a few years ago. While you might find a Mazatlan policeman willing to accept a bribe to look the other way, you are at least as likely to encounter a policeman or policewoman that takes deep offense at your offer (just like in the United States or Canada) and piles an "attempting to bribe a police officer" charge on top of whatever else he or she stopped you for in the first place (just like in the United States or Canada). 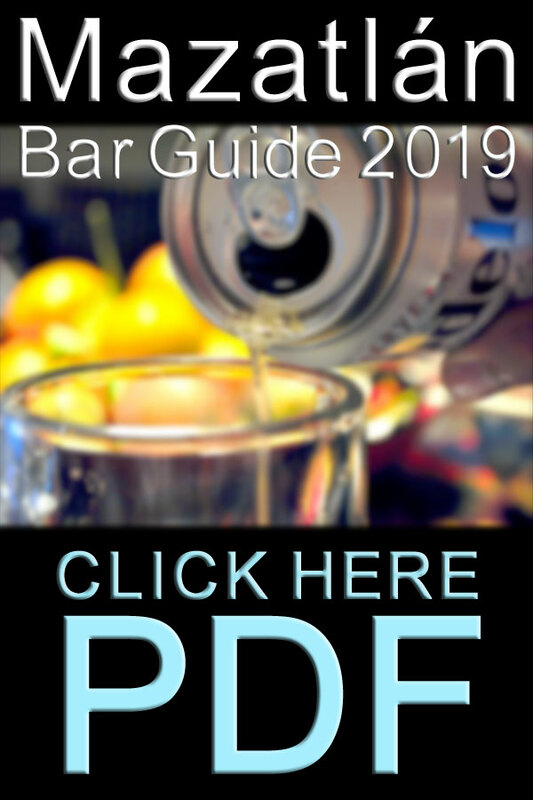 Spring Break 2020 in Mazatlan, Sinaloa, Mexico - FAQ about beaches, bars, clubs, nightlife and safety tips for the best Spring Break destination in Mexico!